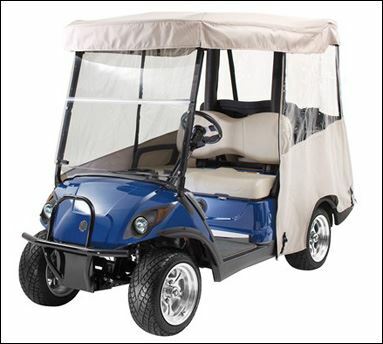 In addition to the worlds best value golf cars, Yamaha offers an exclusive range of genuine imported Yamaha accessories to enhance your transportation or golfing experience. Be it a round of golf or just a casual passenger transfer, Yamaha accessories can add greater comfort and style to your ride. Black roto-molded, single-wall construction with attached flip-up lid. Comfortably holds up to six soft drink cans or four 16.9 oz. water bottles with ice. Easily removed and portable using the attached handle. Comes with all necessary mounting hardware to install on either left or right side. Fits side by side with the Sand Bottle. 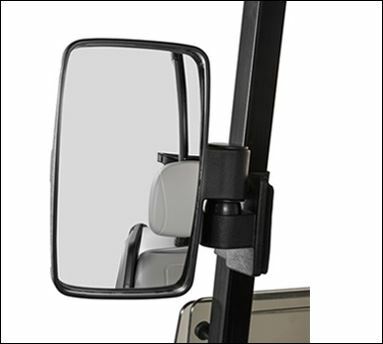 The 4-1/8" x 7-3/4" convex mirror comes with 3/4" and 1" bar clamps to fit many golf cart models. Breakaway feature helps eliminate damage. Made with durable ABS plastic. Ball-and-socket joint for easy adjustment. Fits either right or left side. See everything going on behind you with this sleek style 5-panel rear view mirror kit. Includes all necessary mounting hardware. Fits all The DRIVE cars. Add this sleek, stylish design headlight kit for customization and function. 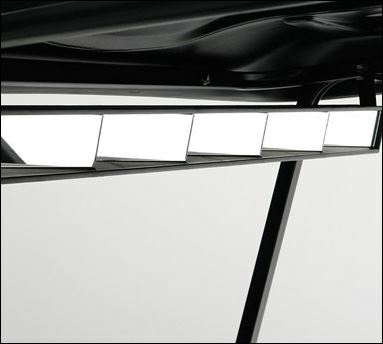 The Standard Kit includes headlights, taillights and side reflectors. 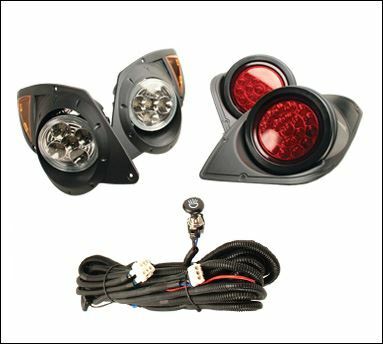 The Deluxe kit includes standard kit plus turn signals and brake lights. Standard and Deluxe PTV kits also include a horn and horn switch. The Supreme kit is a deluxe kit with a random-keyed switch that operates the lights. All kits include all necessary mounting hardware. 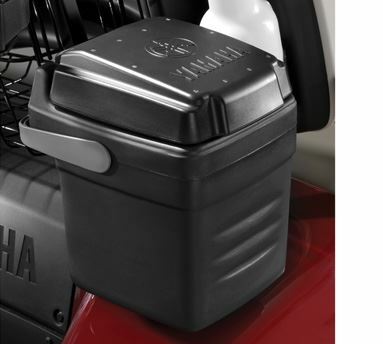 The Yamaha Over-the-Top Enclosures has been precision engineered for a custom fit for each sun top. Features an over-the-top, trackless style design. Installation is quick and easy with no tracks or hardware to install. No modification or drilling required. Can be installed and removed in minutes. No unsightly tracks when enclosure is removed from car. Can be moved from unit to unit without any hassle. Attaches to front support with wrap around hook-and-loop front sleeves. Securely fastens to bottom of unit with adjustable, hook-and-loop straps. The rear of the enclosure fastens to the underside of the sun top with hook-and-loop straps. Features heat-welded seams between the clear vinyl and side panels. Available in heavy duty, marine-grade, 1300D vinyl or marine-grade, 600D, 100% solution-dyed polyester fabric. Both materials are UV and mildew/mold resistant. Comfortable padded seat covers protect new seats and renew the look of old or damaged seats. Extends the life of your seats-protects against dirt, sun damage, and wear. Machine washable for easy care. 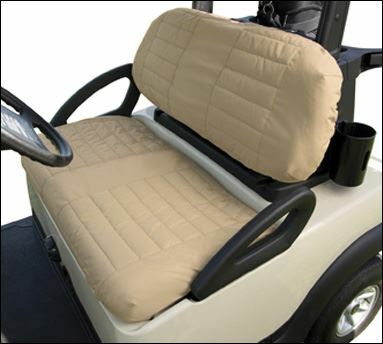 Elastic hem and strap system provides a custom fit that works on most golf car seats in minutes. No tool installation. Padded fabric won’t shrink or stretch. Durable, water resistant fabric. Universal fit for most golf cars.